It is easiest to screw the adapter onto the lens first and then bayonet the lens with the adapter into the camera. 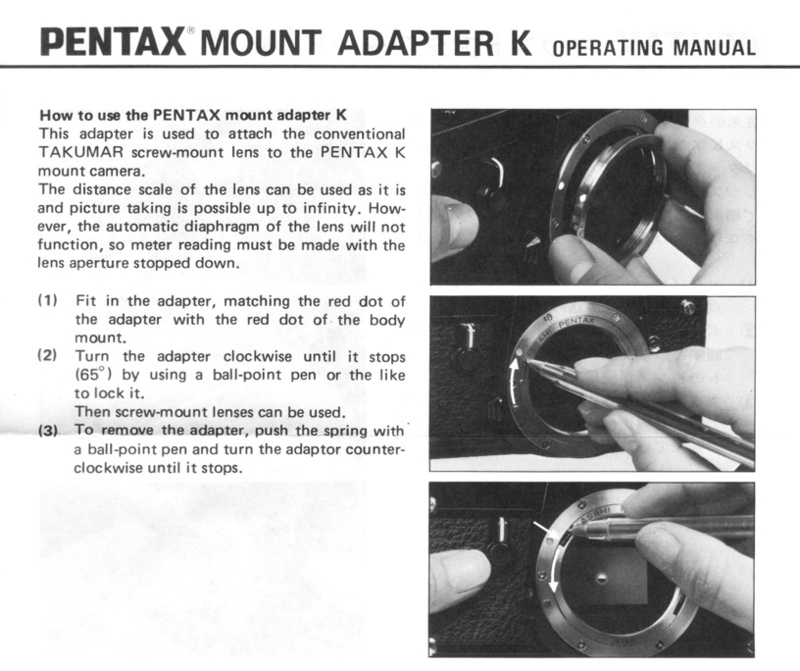 Before removing the adapter, you must screw off the lens. Next, use a ball-point point pen (or fingernail) as explained in the instructions to disengage the spring in the adapter and twist it off, pushing counterclockwise with the pen. Warning: Certain non-Pentax screw mount lenses will get stuck when mounted on a Pentax auto-focus camera body and they can only be removed by a repair shop. Those lenses have a protrusion which will snap into the autofocus coupler hole or into the screw heads on the rim of the Pentax bayonet and thus lock the lens on the camera. Do not use any non-Pentax screwmount or bayonet lenses before you have verified that they have no irregular protrusions on the rear.